How To Choose The Best Countertop Convection Oven For Your Kitchen? 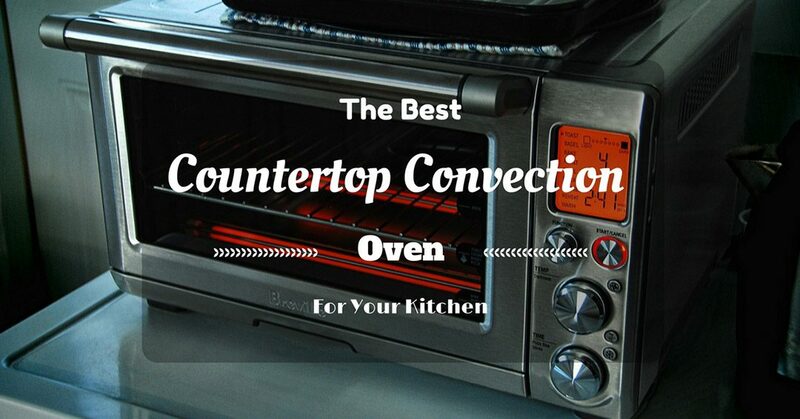 →How To Choose The Best Countertop Convection Oven For Your Kitchen? There are some factors that you should consider before you choose the best countertop convection Oven. They include energy efficiency, rotisserie setting, cleaning, and the price of the oven. Some people look at the space that the oven will consume. The style and the appearance should be considered too. The Oven you choose should blend well with your kitche﻿﻿n. 1. The Breville BOV845BSS pro convection smart oven toaster with IQ element, stainless steel 1800W﻿﻿. Ensure that you check the unit of energy and heat efficiency units. The best countertop convection Oven should be able to run a small wattage as compared to the ovens that are built-in or wall ovens. The oven should give temperatures that are high. Measure the dimensions of the convection oven that you want to buy. Choose the one that will fit on your countertop space. Some of the features like the rotisserie setting are very important. Ensure that it holds a large or medium sized pizza. The number of racks in the oven and if they can be adjusted. If the racks are fixed, ensure that the cookware you have fits in the often perfectly. An oven with adjustable racks is convenient. It is easier to clean to adjust for other cookware to fit. Consider the cleaning of an oven before you purchase an oven. It should be easier to clean. You can consider another oven if the one you want to purchase is not easier to clean. Cleaning is an important that factor that should be considered before purchasing. Before you buy a Countertop Convection Oven, consider the price and its quality. Most convection ovens are priced higher than the countertop baker or a simple t﻿o﻿aster. Different models have varying prices. Ensure that you check their prices from different sellers. It has a slow cook setting that is designed for cooking longer time at slightly low temperatures. The oven is 1800 W. It has a capacity of 5 quarts with an IQ element. This element is used to move heat where and where it is needed. It has the interior light which can be replaced with a 25 W halogen bulb, G9. It has a fan that makes it cook the food evenly and faster. The oven automatically adjusts the heating elements to ensure that the cooking process is exact. You can cook food for up to 8 hours before the automatic setting turns itself to keep the cooked food warm. The oven measures 15.75” deep, 18.5” wide, and 1” high. It comes with a 12 by 12 broiling and baking pans, 13” pizza pan that is nonstick. It is used to bake pizzas, roasting meat that is succulent, toasting evenly, and making delicious cookies. The cooking time is reduced radically by this Convection Oven. The oven has menu functions that suggest the ideal time and temperature. The oven is able to remember them all when it is used again. Then oven adjusts the elements of heating automatically to ensure that the cooking process is exact. ​The oven has an interior light that helps you to monitor your food as it cooks. The slow cook function of the often is designed to lower temperatures for the long cooking time. This provides the flavors and tenderizes the food. The oven reduces the cooking time greatly. It has the IQ element that controls the heat elements s that they can meet your cooking needs using the 10 functions. It has a key timer that switches off and alerts you. It also has frozen food and temperature conversion functions a rack that auto-ejects magnetics and LCD changing color. The oven can accommodate Dutch oven vessels, 5 quarts with a foil lid and vessels, 3.5 quarts with lid. It may get too hot at the back. It is not so good for toasting. It may result to too dark or burnt crusts. It may break if it is not handled well. The oven distributes heat evenly and consistently all through the baking process. This will provide better results. It can be used to bake your pizzas, keep any dish warm that has been cooked, broiling a dish, and toasting bread. It has about 9 functions that are pre-programmed. An example is the Asado function which is used to adjust the heat from high to an optimum temperature for better roasting. The timer is used to remind you when the food is ready. This helps to give you enough time for the given recipes. The oven offers enough space to cook two pizzas of 12” or the Cornish hens. 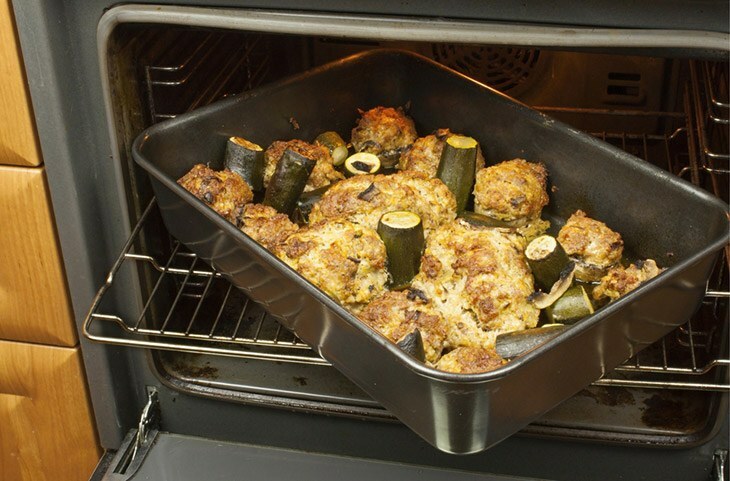 The cavity of the oven has a nonstick coating that makes it easier to clean. The oven has a cooling rack, a 12” broil rack, 12” multipurpose pan that is nonstick and a drip tray that is nonstick. It has 9 functions that are pre-programmed to offer better cooking results. The temperatures can be adjusted to the desired range. This will ensure that the roasting is done perfectly and the pizza has a crispy crust. 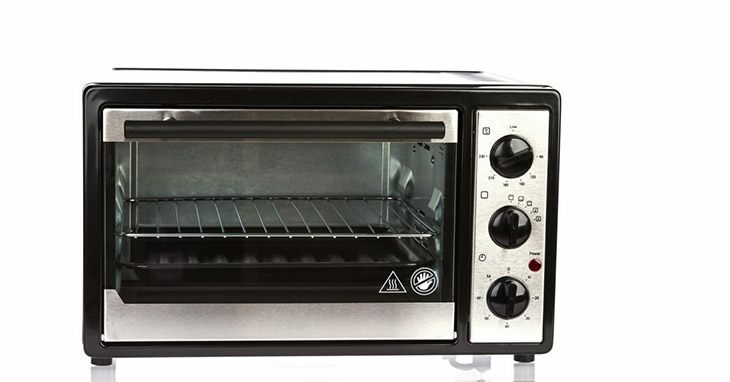 The oven can be used to broil a dish, toast bread, bake pizzas, and keep your food warm, bake cookies, and roasting. It has a capacity of 12” which provides enough room to cook 2 Cornish hens or pizzas. The interior is nonstick, this makes the cleaning process easier. The interior is made of ceramashield. This makes it scratch resistant and it is free of PFOA/ PTFE. It does not get hot on the outside. When the oven is turned on, it preheats automatically. If you don’t press the start button, it will shut off and you will need to start off. If it is used at 400 degrees, the oven will shut off. The Convection Oven cooks 40% faster as compared to the traditional ovens. You can place a 4.5 lb. turkey or chicken, 12-inch pizza can be baked easily in this oven. It has technology that is specialized for bread proofing. This makes it better for baking and proofing the bread. The oven has 2 hours of steady steam. It has a removable water reservoir. Cooking with steam is the best way of preparing healthy meals. This method has been used for several years throughout the world. It helps to retain the essential nutrients, taste, juices and the shape of the vegetables. It needs little or no oil. It can bake a 12-inch pizza or 4.5 lb chicken. It has a water reservoir that can be removed. ​It has 2-hours steady steam. This makes it outstanding and gives you all steam cooking benefits. It can be used to steam fish and vegetables, make dumplings, bake ﻿bread and the pretzels, and cook juicy poultry and meat. The oven comes with a 32 recipe book. The oven may rust if it is not maintained properly. The glass may shutter at high temperatures. It has maximum versatility. It has a rotisserie which revolves. The meat can baste as it rotates. It has an extra-large space that can fit two pizzas of 12”, a two cake pans, or 9” by 13” casseroles. The oven has a revolving rotisserie. The meat can be basted as the rotisserie rotates. The oven bakes faster and evenly as compared to the traditional ovens. ​It has 2-hour timer settings for broiling and baking. The oven is stylish and can save you a lot of space when cooking. The Hamilton oven is efficient and attractive in your kitchen. You can be able to maximize the power, the convenience and the efficiency of the oven. The oven has a variety of features that are practical and options for temperature. This makes it be incredibly versatile. It has a large capacity. You can bake two Pizzas that are 12”, it can hold cake pans or casseroles that are 9” by 13”. The rotisserie is good for cooking juicy meat and crispy Pizzas. This oven has an oven and a toaster which can be used for a pop-up toaster. This offers compact versatility. It may consume a lot of space if your counter is small. Then oven is not properly insulated. It makes a lot of noise when it is working. The pan has a large interior that can hold a 9” by 13” pan casseroles, ham, roast, chocolate chip cookies, or chicken. The broil is adjustable for low heating or high heating. The temperature range is 150 degrees to 450 degrees. The toaster oven is 6-slice convection technology. This makes the oven to cook faster and more even as compared to the traditional ovens. It has digital controls with an interior light that makes viewing easier. The capacity of the oven allows the circulation of hot air during the baking process. This results to even browning, flakier crusts, and edges that are crispier. It has a digital control that offers accurate time and heat adjustments. The oven has preset functions for cooking that are good for baking food. Toast shade can be selected as desired. It ranges from light to dark. It has a countdown timer that shuts itself down automatically when the time is over. The large interior capacity makes it convenient. It can accommodate a variety of foods. Allows you to place the food appropriately for proper cooking. The broil is adjustable. You can cook at the desirable temperatures for proper melting and browning. This oven will give you the best results. The oven has a digital panel that makes its operation easier. You can choose a variety of the available functions. They include convection bake, broiling, toasting, defrosting, and warming. The interior light helps you to view the food clearly as you cook. It is perfect for large families. Heat is distributed faster and evenly all through the cooking process. This is because it has the convection technology. There are two rack positions. They will allow you to customize the space, mostly for a tall roast. The features have a finish frame that is stainless. This makes it a friendly digital or manual control panel for convenience. You can see through the door. This makes it easy to monitor the food in the oven. It is easier to clean the interior. The external crumb tray can be removed easily. The oven comes with a baking pan that is durable. The toast function is not reliable. It cannot function without the removable bottom wire rack. The door handle may get too hot. The capacity is not large enough. I love the Breville ﻿BOV845BSS ﻿Smart﻿﻿ oven pro convection toaster with IQ element, stainless steel 1800W. The oven automatically adjusts the heating elements to ensure that the cooking process is exact. It has a slow cook setting that is designed for cooking longer time at slightly low temperatures. You can cook food for up to 8 hours before the automatic setting turns itself to keep the cooked food warm. The back of the oven is not insulated, you should be very careful when using it. It has a key timer that switches off and alerts you. It also has frozen﻿ food and temperature conversion functions a rack that auto-ejects magnetics and LCD changing color. This makes it my best choice. Before you purchase Best Countertop Convection Oven, check the features carefully. Ensure that you choose an oven that will meet your cooking needs.